The planned sell-off of George Elliott hospital has been cancelled, hailed as a "victory for common sense" by unions and campaigners. Controversial moves to offer the running of George Eliot NHS hospital in Nuneaton to private companies have been abandoned, it was announced today. 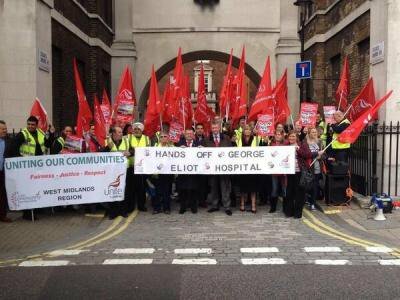 George Eliot was to have been only the second hospital in the country to face a private franchise takeover. The final three bidders in the running were private companies Circle UK (the hedge fund backed ‘social enterprise’ that already runs Hinchingbroke Hospital as a 'franchise'), fellow Tory donor-owned Care UK, and South Warwickshire Foundation Trust as the last NHS bidder standing. A second NHS Trust, Coventry, was controversially excluded from bidding last month due to the size of its PFI debts. Unions and campaigners had fought the planned outsourcing hard - only last week pressing their case with the Trust Development Authority while community campaigners held a demonstration at its offices in London. Questions are already being asked about how much has been spent so far pursuing the abandoned outsourcing for the last two years, and why it was ever considered. Whilst hospitals across the country are struggling to reconcile funding cuts with ensuring quality is not compromised, George Eliot is one of many smaller hospital trusts yet to achieve Foundation Trust status. Under the Health & Social Care Act 2012 all Trusts must soon become semi-independent Foundation Trusts - but the business-like model, originally for flagship hospitals only, is seen as particularly unsuitable for smaller hospital trusts. Last year the regulator Monitor announced it was suspending the creation of new Foundation Trusts given these concerns. But what is the alternative? Alongside 14 other Trusts George Eliot was placed in ‘special measures’ last year and received mentoring from Birmingham University Hospital. So far only George Eliot and Weston hospital in the South West had gone down the Hinchingbroke route of offering up the entire hospital to private sector management. Earlier this month new Care Quality Commissioner boss David Prior, a former Conservative MP, drew sharp criticism when he called for more Hinchingbroke-style private hospital takeovers. The future of the Foundation Trust model and of smaller hospitals remains unclear. McGee told the Health Services Journal that he "did not know" whether George Elliott could still make Foundation Trust status. Financial regulator Monitor is currently quietly undertaking a review into whether half of the country's hospital trusts - the smaller ones - are both clinically and financially "sustainable". For smaller Trusts up and down the country, some have suggested "bundling" hospitals together as an alternative - though whether this would be under NHS management, would result in closures, or leave them to be run by private foreign companies as David Prior suggests, remains to be seen.